I just couldn't resist using real denim on my card today. Plaids and denim...it's a Girl thing!!! 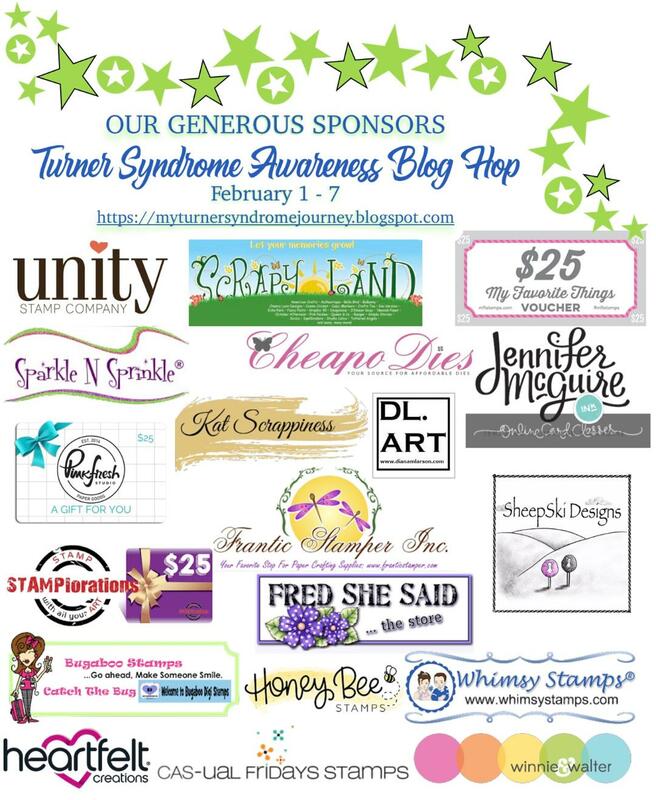 Visit the "It's A Girl Thing" Turner Syndrome Awareness Inaugural Blog Hop page to become eligible for prizes. 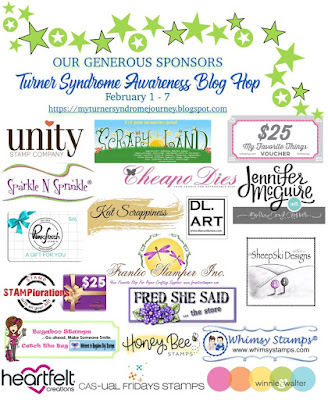 I must admit I had never heard of Turner's Syndrome until I was asked to be a part of this hop. Who knew such a disease existed?!? These girls may be small, but they be mighty in courage! Penny ~ Thank you for being a part of this Blog Hop! I love your sentiment! The denim paper is great! Beautiful card! Penny, your card is amazing - exhibiting the abstract of our genetic make-up, with the broken or incomplete links of the chromosome, but make it all so amazing - a mystery solved! #gorgeouslydone! (giggle) Wishing you a wonderful week-end! Yes to denim + plaid. I love that you used real denim! So fabulous! Beautiful colors and stunning card! That sentiment is perfect too! Thanks for bringing awareness to a syndrome many of us had never heard of. God Bless You! How clever to use the real thing! Yes to denim and plaid! Your colors and design fit the theme perfectly. Wonderful work! This is so beautiful!! I love the design and the sentiment!! It's gorgeous!! 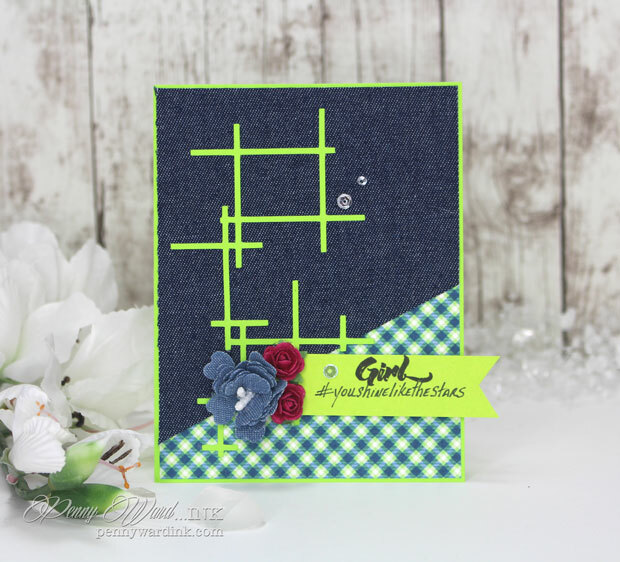 I love that denim background and those sweet roses on this beautiful card! Your card is so amazing Penny! Love the use of real denim on your card! Beautiful! Wow, I just the love all the details on this beauty. Beautifully done. The denim rocks with the colors and design, like it was all made to go together...awesome card!! Fabulous card Penny! Love your design and the plaid and denim look amazing together. What a fun & creative design; I love it!! I never knew about this disease either. I think it's crazy that it's 1 in 2500 female births!! I really like the denim card! I learned something new today, thanks to your post. We need to be aware that there are people among us dealing with "invisible" challenges. Always be kind. Oh my gosh, this is such a pretty card and that denim adds such a fresh touch. Love your card! I am just learning about this syndrome now too. What a fun design and sentiment! 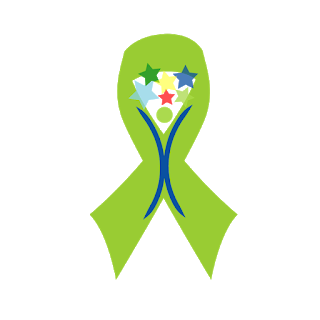 Thank you for bringing awareness to this syndrome and being a part of this hop! 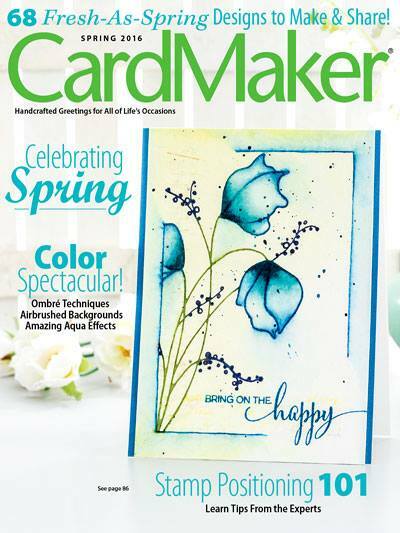 Thanks Penny for the wonderful design and for participating in this worthwhile blog hop. what al lovely card for this TS-bloghop! Great with the denim and the geometric diecut! wonderful text too! I like the way you think, Penny - denim and plaid - definitely a girl thing! Love your creative design and the use of actual denim in your card. The flower is fabulous! Thanks for sharing. What a fabulous idea to use denim, is it a link to jeans or rather genes ? Fantastic, unique design, great vibrant colours. Thank you for raising awareness of this condition in such a beautiful way. 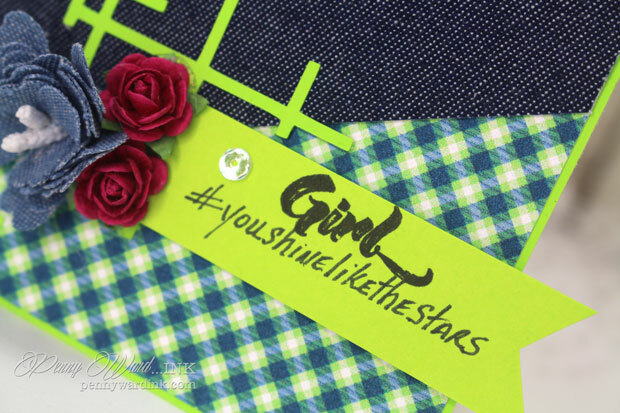 Creative use of denim on your pretty card! Thank you for sharing your work for such a good cause. What a beautiful card and lovely sentiment Penny! Great job! Wow this card is soo cool, Penny! The denim, all the hashtags.... took me a minute but I saw them all! I love how hashtags can spread kindness and beautiful ideas :) Love it. Such great vibes from this trendy card! Love the denim, bright hashtags, and those sweet flowers. Thanks for being part of sharing information about TS! Beautiful! I've always wondered how to use the fabric florals on a card and this is just perfect! I'm with you...never heard of this syndrome until I heard of the blog hop! I love your use of the real denim and plaid...very cool design!! I love the beautiful simplicity of your card. For me, after all I've read about TS & the great visuals Lori has for us it is a perfect fit <3 What a great way to use fabric too :) Thanks for sharing!! I am just loving that denim! Thanks for joining in the hop for a worthy cause. the denim really sets off the style on this card! Beautiful card! Love the colors you used! Awesome textures too! What a cool card! Love this! Love the color combination and the geometry! Your card is so beautiful! I love it!! I love the bright green against the denim color. Awww... love the pretty flowers on your sweet card! Fabulous card! Love the texture of the denim and the play of the graphic elements with the organic floral elements. Love the denim and plaid combination. Thanks for sharing. I love the denim and the pretty plaid on your gorgeous card. Love your denim card (and your cute dog too)! Great design and I like the use of denim and the flowers. Great design. I like the geometric aspect. Thank you for helping Lori with this endeavor. Penny, what a beautiful card. I love the geometric green part. It made me think of a trellis. Awesome sentiment. Wonderful card! 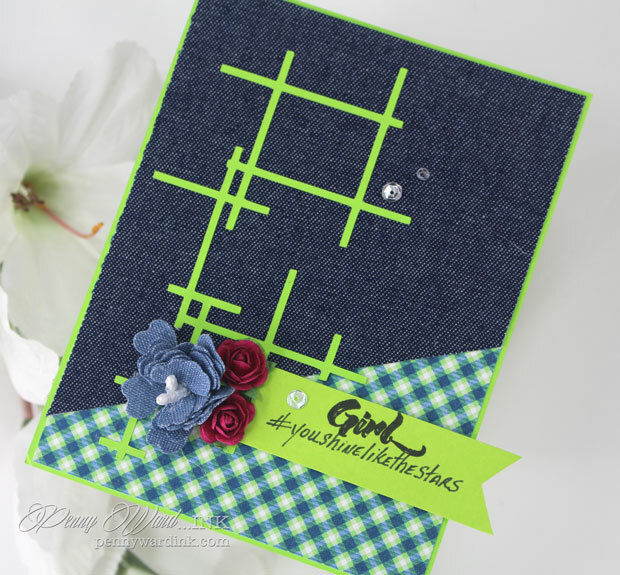 Love the denim look for the background and the geometric "trellis" for your pretty flowers!! Such a lovely palette on this fab card, and a lovely idea to incorporate fabric on your card. You have a gorgeous card! I love the look of the texture! 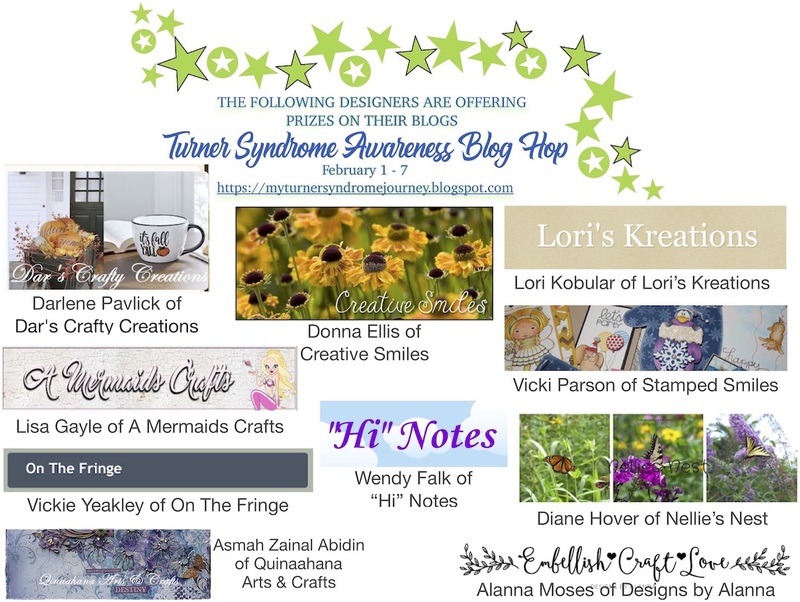 Thanks so much for being a part of this important blog hop today! amazing design, I love denim! Ohhh, this is amazing!! Love all the texture on your card!! Your card is really elegant and the wording is from your heart. 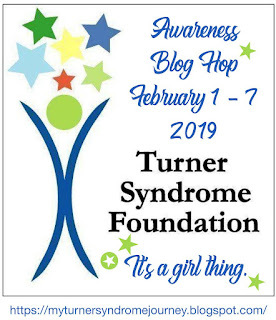 Thank you for taking part in the Inaugural Turner Syndrome Blog Hop to make us aware that such a condition exists among girls. Thank you for encouraging these butterflies to fly. May you be blessed with gd health and happiness always. Hugs and loads of love from Sri Lanka. Thank you for your inspiration, Penny. I had never heard of Turner Syndrome before either. I have gotten quite an education this morning. Girls do love denim! This is a cute card! Awesome idea! You are an Angel for doing this blog hop! Love the denim! Gorgeous card and thanks for this wonderful initiative and raising awareness! !